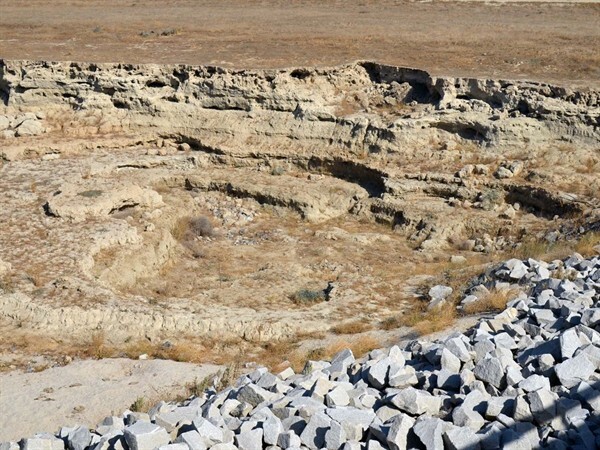 One of the few current bright spots on California’s waterfront is that the drought seems to be spurring momentum to improve groundwater management in the state’s rural areas. 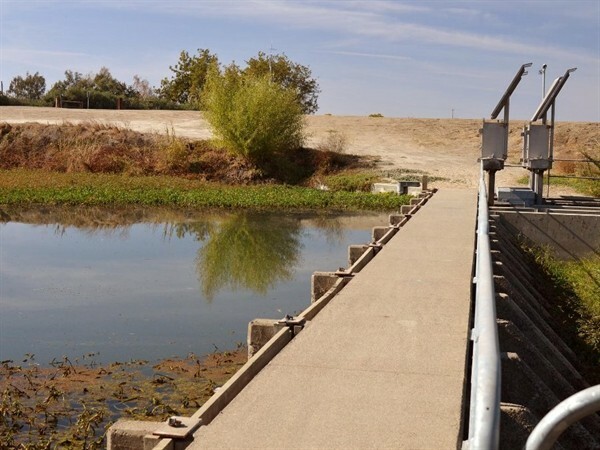 Outside of a few dozen adjudicated basins and specially authorized groundwater management districts – located mostly in urbanized parts of Southern California and the Bay Area – local groundwater oversight remains largely voluntary and somewhat precarious. Despite recent advances in basin monitoring and recharge programs, these more voluntary efforts lack the teeth needed to prevent long-term declines in the water table. The costs of this management gap are manifold: damage to infrastructure from sinking land levels, salinity intrusion in coastal aquifers, and harm to aquatic ecosystems where groundwater pumping dries up wetlands and streams. And as this year’s events have highlighted, the most overdrafted areas are unable to effectively serve one of groundwater’s most important roles: a buffer against drought. Gov. Jerry Brown’ s new Water Action Plan highlights sustainable groundwater management as a top priority. The proposal is to empower local agencies to better manage the resource, and then commit the state to step in as an emergency backstop if locals fail to come through. This type of layered governance approach – sometimes referred to as “subsidiarity” or “cooperative federalism” – makes a lot of sense for groundwater, because it facilitates the development of effective solutions by those most familiar with local conditions and most affected by management decisions. The backstop – a credible threat of intervention by the state if locals do not act – is an important means of motivating local action (Hanak et al. 2011, Ch. 9; Ostrom 1990). Adequate funding will be essential to effective reform. Although state dollars might provide some incentives, local entities must have sufficient authority and flexibility to raise the funds needed to carry out sustainable basin-wide management. Three questions merit consideration: (1) What do groundwater management agencies need money for? (2) Where have they been getting the cash to date? (3) What are the key barriers, and potential solutions, to funding sustainable local programs? What do groundwater management agencies need money for? Implementing basin recharge operations to achieve a long-term sustainable yield. This requires expenditures to support pumping and conveyance infrastructure, and to cover the costs of supplemental surface water. Although many initial recharge efforts in California focused on purchasing imported water, programs today also include supply augmentation with recycled wastewater and captured stormwater. These new programs usually entail both capital improvements and increased operating costs. Less discussed, but equally important, groundwater agencies also should have the ability to levy pumping charges to help prevent excessive groundwater use. This is a key management tool in non-adjudicated basins, where no formal quantification limits pumping. If these charges are effective in discouraging excessive pumping, they won’t necessarily generate new revenues, although any proceeds can also support basin recharge efforts. Where have groundwater management agencies been getting the cash? It’s important to distinguish between the few dozen agencies that have special authority to manage basins and raise funds for that purpose – special act districts and adjudicated basins – and everyone else. The agencies with special oversight authority have responsibility for managing less than one-fifth of California’s groundwater use . They have been able to charge basin users, and the charges are usually tied to volume of water pumped ($/acre-foot). Fees sometimes vary by type of user (agriculture versus non-agriculture), location, and levels of use, and they sometimes exempt small users or a base allocation. The volumetric charges also vary across agencies, depending on the costs of replenishment water. The pricing practices of each agency depend in part on their specific statutory requirements. 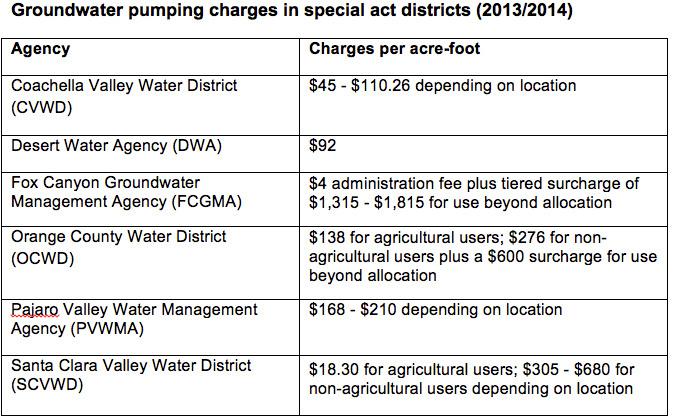 For instance, OCWD and SCVWD are required to charge a lower pumping fee for agricultural water use. And while OCWD and FCGMA use tiered rates to limit excessive pumping, SCVWD does not believe it has authority to charge higher fees for this purpose (La Peidra 2014). 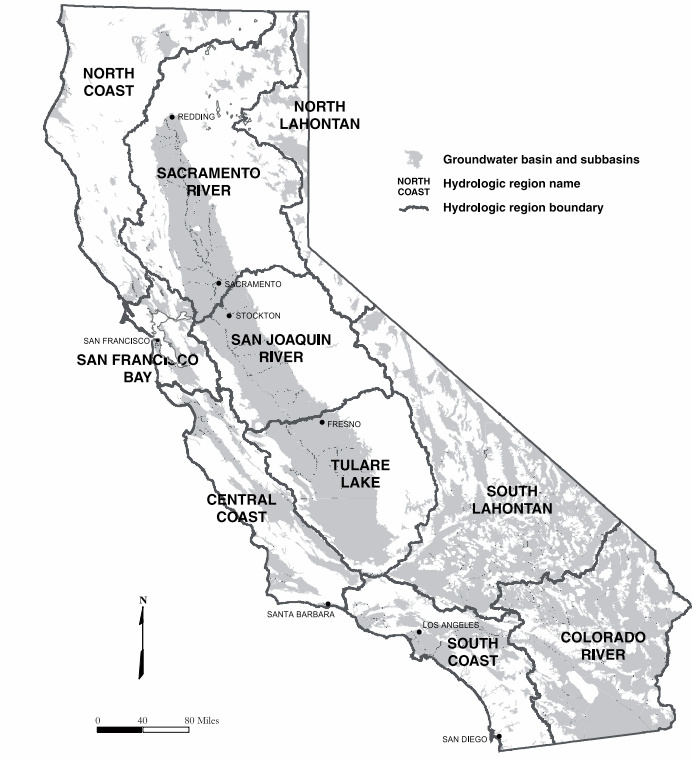 California currently has 22 adjudicated basins – mostly in Southern California – where the rights to pump groundwater have been determined by the courts (Blomquist 1992). Management entities for some of these basins charge replenishment fees for pumping in excess of court-authorized allowances. For instance, the Water Replenishment District of Southern California (WRDSC), a special act district created to manage the adjudicated Central and West Coast Basins, currently charges a replenishment assessment of $268 an acre-foot (af) of water. Recent charges for pumpers in the Chino Basin (2011) and Mojave Basin (2012/13) were $574/af and $405/af, respectively. These latter two basins also have a useful monetary means of managing pumping through active trading among water users, whereby those wanting to use more than their allotment pay others to reduce their water use. This type of trading might be worth considering in some areas now looking to manage their groundwater resources more sustainably. It would likely require a mechanism to ensure that overall basin pumping levels are limited (e.g., acreage-related baseline withdrawal limits, with higher fees for more pumping, as within the FCGMA). The vast majority of groundwater use is overseen by local management entities with less formal structures. Information is harder to come by on how these agencies fund their programs. Some Central Valley irrigation districts have long sought to manage basins by setting the price they charge for surface water lower than their members’ costs of pumping groundwater (Vaux 1986; Jenkins 1992). This approach can work when overall water availability and demand are roughly in balance; it discourages pumping in wet years, when surface water is more plentiful, allowing groundwater to replenish so that it’s more readily available in dry years when surface water supplies are scarce. However, this approach has proven incapable of halting long-term basin declines in the many areas experiencing increases in irrigation demand, declines in surface water supplies, or both. Since the early 1990s, many local agencies in the Central Valley and elsewhere have used the authority provided under Assembly Bill (AB) 3030 to get a better handle on basin management. This law, enacted in 1992, provides broad enabling authority for local agencies outside of adjudicated basins and special act districts to develop groundwater management plans. In principle, they also can charge replenishment fees under authority similar to water replenishment districts such as WRDSC if they obtain the approval of a majority of their voters. The decade following the passage of this law saw a flurry of plan development: By 2003, approximately 200 local agencies had AB 3030 plans, in some cases as part of multi-party agreements (DWR 2003; Hanak 2003). Incentives to improve these plans increased with the enactment of Senate Bill 1938 in 2002, which made state funding for groundwater projects contingent on the preparation and implementation of a groundwater management plan. It seems unlikely that the total number of plans has increased in the ensuing years. As of 2012, the California Department of Water Resources (DWR) estimated the total number of plans at 131. But DWR staff told us that the quality of plans has improved since SB 1938 (DWR 2013, regional reports). Although AB 3030 management agencies have made advances in basin monitoring and measurement — and, in some cases, recharge activities — they generally do not exercise rigorous basin oversight. Indeed, the current effort to extend broader authority to local management entities reflects the limits of the AB 3030 approach. Groundwater banking projects with third parties have provided a useful supplemental source of funds for recharge infrastructure in a few places, especially in Kern County (Hanak and Stryjewski 2012). State bond funds have also supported local groundwater management efforts – including monitoring, modeling and recharge infrastructure. Between 2000 and 2012, DWR made roughly $350 million in grants and low-interest loans available to local agencies for groundwater storage (Hanak and Stryjewski 2012). This support was extended to agencies with special management authority (and pumping fee revenue) and those with more limited revenue sources. What are the key local funding barriers and potential solutions? 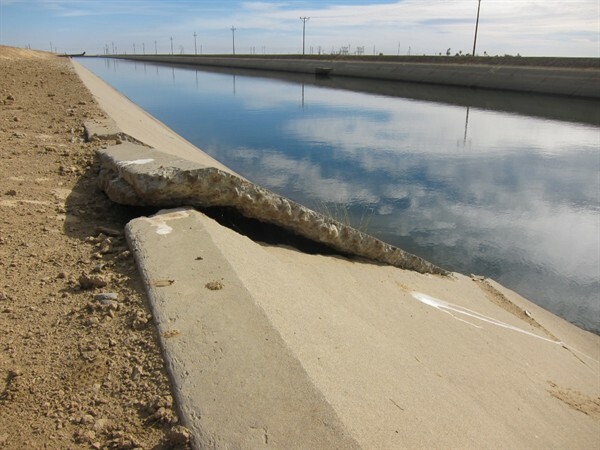 In recent years, there have been significant concerns that Proposition 218 – a voter-approved constitutional reform enacted in 1996 – presents a major barrier to sustainable groundwater management, even for agencies with special oversight and fee authority. The most recent appellate court decision on this issue, Griffith v. Pajaro Valley Water Management Agency, provides hope that some of the most vexing concerns regarding the interpretation of this law for groundwater management have been laid to rest, paving the way for using fees to manage basins effectively. We analyzed this case in our recent study, Paying for Water in California (Hanak et al. 2014, esp. Appendix A). In Griffith, some groundwater users objected to paying the agency’s pumping fee, designed to reduce overdraft and protect those pumpers in the coastal zone from salinity intrusion. Our main concern was that the trial court, which sided with the plaintiffs, interpreted the substantive requirements of Proposition 218 in a manner that the text and purposes of the law did not compel and that would discourage sustainable, integrated groundwater management. Proposition 218 requires that the fees for a “property-related” service be proportional to the costs of service to the property, and that property owners be charged only for services delivered to their properties. In the case of groundwater basins, it’s important to recognize that all pumpers contribute to the costs of sustainable management, even if they aren’t experiencing identical impacts from pumping or recharge activities. In our view, the appellate court correctly ruled that groundwater management provides a service for the basin as a whole, and that this legally can include charging all pumpers to fund activities such as recharging the basin with recycled wastewater or captured stormwater — even if this recharge is not evenly distributed around the basin. This ruling, which now is the controlling case on this issue, sets a good precedent and validates the practices of those agencies that have been charging fees to all users to cover basin management costs. 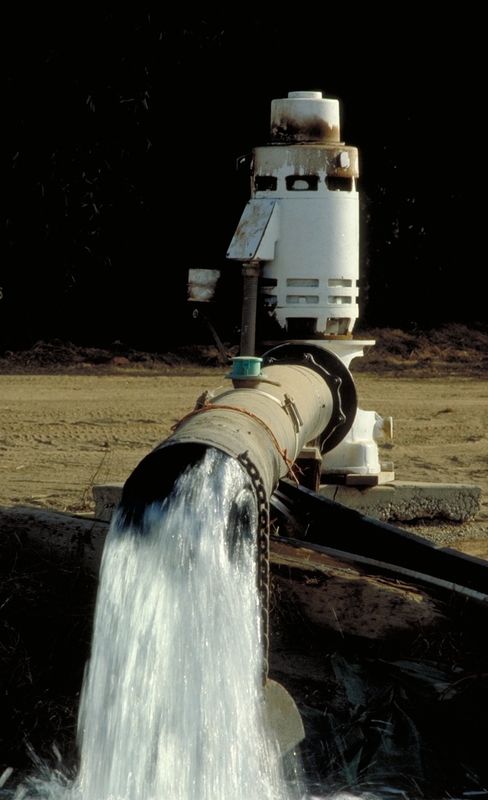 Also significant, the Court of Appeal in Griffith held that groundwater basin management activities are a “water service.” This means that groundwater management – like other water supply services – is exempt from Proposition 218’s most onerous procedural requirement – the need to gain local voter approval for every new increase in fees. While some of Proposition 218’s procedural measures are important for transparency and accountability – including the requirements to publicly notice all rate changes and to give ratepayers the opportunity to overturn rate increases at protest hearings – the law crucially exempts water, sewer and solid waste management services from an additional requirement of active voter approval for any new fees. In contrast, Proposition 218’s voter approval requirement does apply to both stormwater and flood management services. As we show in Paying for Water in California, this been a hard hurdle for local agencies to cross. Water and sewer utilities are generally in relatively good fiscal health and able to meet the service requirements expected of them. Many stormwater and flood management agencies, however, are failing to do so. The Griffith case does not resolve all uncertainties regarding Proposition 218 and groundwater management agencies’ fee authority. The Water Replenishment District of Southern California is still in litigation over similar issues to those raised in Griffith (Hanak et al. 2014, Appendix A). And the Desert Water Agency is in litigation with the federal government over a federal agency ruling that disallows DWA from charging non-tribal leaseholders on tribal lands within its service area the replenishment assessment; under Proposition 218, DWA cannot legally simply pass on those costs to other users within the district (Desert Water Agency 2014). Finally, special act districts that are required by law to assess lower pumping fees for agricultural users — such as OCWD and SCVWD — may be vulnerable to challenges under Proposition 218’s proportional costs of service requirements, unless they can show the agricultural water service is inherently different (Hanak et al. 2014). This might be legitimate if costs of service are lower for agricultural users (e.g., if the service is interruptible in the event of drought), or if agriculture provides compensatory ecosystem services (e.g., protection of open space and recharge basins). Nevertheless, Griffith appears to resolve two important issues regarding the constitutional authority for local agencies to assess fees for groundwater management: If otherwise authorized to do so, they can charge all pumpers to cover the basin-wide costs of management, and they do not have to obtain voter approval when they need to raise these fees. This suggests that legislative reforms to strengthen local agency funding capacity should focus on extending more flexible fee authority to agencies with AB 3030 plans. In particular, the Legislature should remove the requirement that these agencies seek voter approval before introducing fees. Proposition 218’s procedural requirements already guarantee a large measure of transparency and accountability for water service through the public noticing and hearing process. In addition, the reform package should ensure that groundwater agencies can levy fees to deter excessive pumping – essentially a penalty to mitigate a negative externality (Hanak et al. 2014). The fee model of water replenishment districts now available to AB 3030 agencies may not be adequate for this purpose (Reeb 2014). Under the replenishment district statute – initially designed to complement limits on pumping in adjudicated basins – agencies may only charge a uniform replenishment fee. Agencies that oversee non-adjudicated basins may need authority to levy tiered rate structures to help manage demand. This includes not only AB 3030 districts, but also some special act districts, like SCVWD, which currently lack this authority. The authorizing language for such a provision would need to carefully consider how to make such charges consistent with Proposition 218’s cost proportionality requirement. One way to do this would be to treat such charges as fines or penalties, which are exempt from Proposition 218 (Hanak et al. 2014). To further dispel uncertainty regarding the constitutional legitimacy of groundwater pumping fees, it would be useful for the Legislature to provide guidance to the courts regarding the interpretation of Proposition 218 (Hanak et al. 2014, esp. Appendix A). The Legislature could state its intent that water resources be managed in an integrated and holistic manner for the benefit of water supply reliability for all users within a service area or a basin. This would also serve the state’s interest in reasonable use overall and emphasize the need for flexibility in the attribution of costs to individual properties. Although such statements do not legally bind the courts, they have proven useful in other matters relating to Proposition 218 . A general statement of legislative intent regarding holistic water management could benefit not only groundwater oversight, but also the broader efforts of local agencies to manage water resources responsibly and cost-effectively. It’s worth emphasizing the tremendous value of this “cooperative federalism” approach for strengthening groundwater management in California. California water management is generally a local affair: Local and regional agencies raise 85 percent of all funds spent in our $30 billion per year water sector, and they are a continual source of management innovation (Hanak et al. 2014). By empowering local groundwater agencies to manage this vital resource – through new funding and other oversight authorities – the state can set the stage for further innovation in the service of a more sustainable water future for the benefit of California’s economy, society and environment. Ellen Hanak , Emma Freeman, Caitrin Chappelle, Dean Misczynski and Jeffrey Mount are with the Public Policy Institute of California. Brian Gray is with the University of California, Hastings College of the Law. Jay Lund, Josué Medellín-Azuara and Robyn Suddeth are with the Center for Watershed Sciences at UC Davis. David Mitchell is with M. Cubed. James Nachbaur is AAAS policy fellow in Washington, DC. Buzz Thompson is with the Law School and the Woods Institute for the Environment at Stanford University. 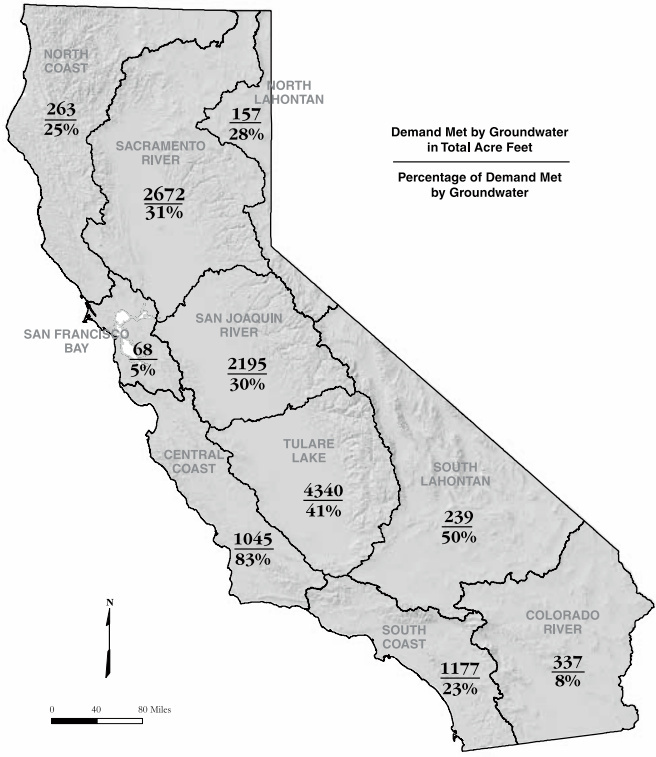 Using DWR water balance data for 2006-2010, we estimate that 80 percent of net groundwater use and 78 percent of applied groundwater use in the Central Coast, Colorado River, San Francisco Bay Area, South Coast and South Lahontan hydrologic regions. Although these regions contain most of the adjudicated and special act districts, this total overestimates the volumes managed by agencies with special oversight authority. On March 24, Ellen Hanak, senior fellow with the Public Policy Institute of California (PPIC), addressed a Brown administration Sustainable Groundwater Management Workshop on a legislative proposal for groundwater management reform. This article elaborates on her comments, drawing on a new PPIC study on water system finance by a team of authors from PPIC, UC Hastings, the UC Davis Center for Watershed Sciences and other institutions. Davis, G. 2014. Comments by Sonoma County Water Agency on the “Sustainable Management” panel, Sustainable Groundwater Management Workshop: Ideas, Proposals, and Feedback. Sacramento, March 24Desert Water Agency. 2014. Jenkins, M. W. 1992. “Yolo County, California’s Water Supply System: Conjunctive Use Without Management.” UC Davis: Department of Civil and Environmental Engineering. Ostrom, E. 1990. Governing the Commons: The Evolution of Collective Institutions for Collective Action. Cambridge: Cambridge University Press. This entry was posted in Uncategorized and tagged Brian Gray, Buzz Thompson, Caitrin Chappelle, California Water Action Plan, David Mitchell, Dean Misczynski, Ellen Hanak, Emma Freeman, groundwater management, James Nachbaur, Jay Lund, Jeffrey Mount, Josué Medellín-Azuara, Robyn Suddeth. Bookmark the permalink. Ellen Hanak is right, the regulation of groundwater is a complex issue and subsidiarity, or “cooperative federalism” may be a good approach to getting a handle on groundwater management. But while Hanak says the drought is “spurring momentum to improve groundwater management” it is important to understand why groundwater overdraft is a bigger problem today than it needs to be. The 20th Century water projects that were built in large part to offset groundwater overdraft can’t be relied upon to continue to serve that purpose. Environmental policies that reduced surface water deliveries to farms, homes and businesses caused many people to return to groundwater to keep their businesses viable. Part of the solution is to properly manage environmental water resources so we get a measurable return on our investment. Millions of acre-feet of water haven’t fixed declining fish populations. It’s way past time for environmental water management plans; similar to the ones required for urban and agricultural water suppliers. A truly viable agricultural business reliant on California’s 20th century water projects must expect a certain frequency of drought years and operate accordingly. That’s basic business sense. Droughts start, droughts end.